There's no bar scene in the world quite like that of Barcelona. As one of Europe's chicest and most cosmopolitan cities, the Catalan capital boasts hundreds of trendy new gastropubs and tapas bars, many of which stand side-by-side with the no-frills watering holes that local families have proudly run for decades or even centuries. Suffice it to say that no matter what type of scene you're after, there's a perfect Barcelona bar for you. We're counting down 15 of the top bars in Barcelona in no particular order so you can find a spot you'll love. If it's not broken, don't fix it. That seems to be the unofficial motto of Bar La Plata, which has been serving the same four tapas ever since opening its doors in 1945. As Barcelona's ultimate no-frills bar in the Gothic Quarter, it's earned a well-deserved place in the city's history. What to Order: Get a round of the only four tapas on the menu — vinegar-cured sardines, fried anchovies, tomato salad, and butifarra sausage — and wash it all down with rustic wine poured straight from the barrel. So often, trendy new additions to Barcelona's bar scene seem to steal a piece of the city's soul. That's not the case with Bormuth, which seamlessly blends the recipes generations of Spaniards know and love with a trendy, contemporary vibe, making it a place for everyone to feel at home. What to Order: Go with their famous fried eggplant with a glass of vermouth. Barcelona has embraced the craft beer trend with open arms, with Homo Sibaris being a forerunner on the artisanal brew scene. With a vibrant local atmosphere and a fabulous on-tap selection, it's a must for craft beer newbies and connoisseurs alike. What to Order: Available beers change somewhat regularly, but their friendly bar staff will be happy to help you find something that aligns with your tastes. With a commitment to supporting small, local producers and providing friendly, professional service, it's no wonder that Bodegas Maestrazgo has been going strong for more than 60 years. As the oldest locally owned wine shop in Barcelona, it's a place to relax and enjoy good wine in good company. What to Order: Go local and order a wine from one of Catalonia's 11 denominación de origen wine regions. A sleek, low-lit wine bar in the heart of one of Barcelona's most happening districts, El Diset is the trendy, contemporary spot of your dreams. What to Order: Come for the excellent variety of Catalan wines (which make up 90 percent of their selection); stay for the tasty torradas (thin, crispy toasts piled high with delicious toppings). A one time 19th century tavern, the locale that houses Big Bang Bar now draws rock and roll fans from near and far to the bar's unrivaled live performances from Wednesday through Sunday every week. It's not just limited to rock, though — jazz lovers will want to check out their Friday night jam sessions. What to Order: Order up one of the fairly priced beers from their excellent selection to sip as you enjoy the show. It's hard to find authentic flamenco in Barcelona, and while Los Tarantos does draw its fair share of tourists, even locals are known to be captivated by the passionate, awe-inspiring performances by world-renowned artists at this intimate venue. What to Order: Get a delicious homemade cocktail from the bar — then sit back, relax, and enjoy the show. Vermouth isn't just for adorable Spanish grandpas anymore. Thanks in part to Morro Fi — a contemporary vermutería opened by three foodie friends — this tasty traditional aperitif has won the hearts of Barcelona's younger generation as well. What to Order: Their house blend of vermouth is the bar's signature drink. Try it with some salty olives or gourmet tinned anchovies. As if the absolutely stunning location facing the Santa Maria del Mar church wasn't enough, La Vinya del Senyor boasts one of the most extensive wine lists in Barcelona, including a respectable selection of cava (Spain's answer to champagne). 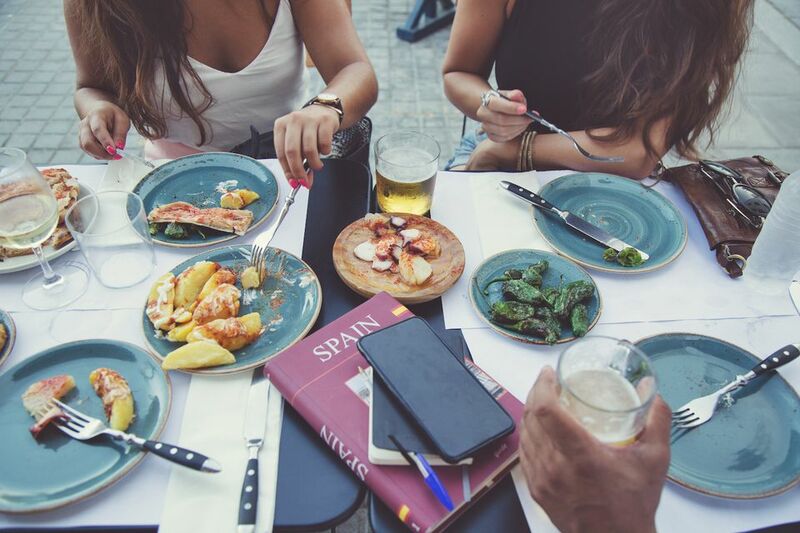 What to Order: The ultimate Barcelona experience is all yours here: a crisp glass of cava and a charcuterie plate, best enjoyed while sitting out on the sunny terrace. Time travel may not be possible (yet), but until it is, you'll have to get your roaring 20's fix at Gatsby. This colorful, happening cocktail bar lives up to its name with all the glitz and glamour of the 1920s with all the Instagram-worthiness of the 21st century. What to Order: Any one of their signature cocktails is an excellent choice. If you're with a group, consider one of their large-batch cocktails (made for sharing) inspired by the characters in F. Scott Fitzgerald's iconic novel. Skybar provides the quintessential travel experience: signature drinks among a cool crowd with a bird's-eye view of one of Europe's most charming cities. What to Order: Beer and wine are reasonably priced, but for the full experience, go with a cocktail. Ice isn't your standard beach bar. Namely because the entire interior lounge is decorated completely with — you guessed it — ice. It's the perfect place to beat the heat in Barcelona's scorching summers, but if the 23 F temperatures get to be too much, their sunny outdoor terrace area overlooking Barceloneta Beach is completely ice-free. What to Order: Go with one of the cocktails from their curated menu, each one specially mixed to withstand the chilly temperatures. Surprisingly, it's hard to find good sangria in Spain — it's generally thought of as a touristy drink, and most of it is pretty low quality. That's not the case at Casa Lolea, whose famous polka-dotted bottles of the popular wine cocktail have won the hearts (and taste buds) of thousands of locals. What to Order: In addition to their iconic house sangria, their newer rosé variety is delicious as well. Escape to the tropics without leaving Barcelona. Kahala will make you feel as if you've been whisked away to Hawaii with its island-inspired furnishing and colorful tropical cocktails, some of which come served in a coconut for the full effect. What to Order: The Coco Loco rum cocktail captures the essence of summer with every sip. For something fruitier, go with the Piña Tropical. A true fairytale paradise, El Bosc de les Fades, is more than just a bar — it's a fantasy forest complete with twisting trees, friendly woodland creatures, and thunder sound effects. What to Order: Go for an ice cold beer accompanied by one of their tasty homemade tapas. Barcelona Discount Cards: Are They Worth the Money? Where Can I Find Roman Ruins in Barcelona?